Adrasteia Lakent is on the verge of her 18th birthday when she decides to take a chance and find her father, a man whom she knows nothing about apart from his first and last name. Driven by never having a father figure in her life, she devastates her mother with a planned trip to Oregon, her place of birth and the last place Derek Lakent was seen. Before she can even pay for her plane ticket, things start going horrifically wrong. Soon her boyfriend is being accused of murders she knows he didn't commit, and her mother is ushering her to the airport before she has the chance to graduate high school. After arriving in Oregon, the truth is uncovered and it isn't anything close to what she envisioned. Everything she's ever been told has been part of an intricately spun deception. She finds herself wrapped up in a destiny she never fathomed. Will she embrace the fighter within or give in to her predetermined fate? Greekorians: a world she never knew she was a part of. Lacole: I'm 29 and have two wonderful little girls. I work as a daycare provider at my gym, an Independent Beach Body coach, and a writer. I live in Oklahoma where the weather is completely bipolar. I have a major addiction to reading, writing, loud music, and exercising. You can catch me on any given day wearing t-shirts, jeans, and running shoes. Lacole: I began writing in 1994-1995 which would have been when I was in the fifth grade. I wrote a short story about a horse, a dog, a cat, and some other animals. I don't really remember what the story was about, all I remember was my father being proud of me and gloating to all of his friends. From there, I would write short stories, poetry, and try (and fail) at writing a novel. There is still a story I came up with before my oldest daughter was born (six years ago) that I have yet to finish. 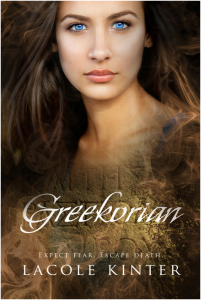 I started writing Greekorian in 2009 and finished the very first draft in 2010 after my youngest daughter was born. It sat on my computer collecting dust until I pulled it out again last year and began working on it. Lacole: My most recent release, Greekorian, is about a young girl who has never known her father. She decides she wants to change that and plans a trip to Oregon, her place of birth, after her high school graduation. What she finds is beyond what she ever imagined. She finds out the truth about her father, and about a truth she never could have imagined. It is categorized as a YA and has very little curse words and absolutely no sexual scenes. Though there are hormone driven teenagers in this book, it's not the focus. I wanted to write something geared more towards a younger audience. Lacole: Honestly? I stumbled across Twilight when someone I worked with wore a shirt advertising the upcoming movie. I had never even heard of the books and since I love reading books that turn into movies, I went out and bought the first book. I finished it in no time, but as I was reading it I thought to myself "Why in the world have I not written a book yet?" I read all of the books and a story started forming into my head. The story I formed in the beginning was nowhere close to what Greekorian has become. The idea started off with a teenage girl who's parents had died in a car accident and vampires were involved. Crazy, because Greekorian doesn't have a thing to do with vampires. So many things have changed while I've been writing this book and I couldn't be more happier with the outcome. Lacole: Malorie, the main character's best friend, has to be my favorite. She's beautiful, she's sarcastic, and she's very giving. She sincerely loves Adrasteia (main character). She's kind of like the popular girl in school who has everything, except her personality doesn't match. Lacole: The most challenging part had to be finding time to write. With two small children and going through some things I've been through, writing had to be last on my list of priorities. Oh yeah, I also get distracted easily so that can be pretty challenging. It's like, I'm talking to someone and all of the sudden I can't hear what they're saying because I am watching a butterfly float across the sky. Lacole: My primary goal is just to get my stories out there and have someone read them and love them. Even if it is just ONE person who loves what I write I will feel accomplished. Although, I also have a goal of having one of my books made into a movie. Hey, ya never know! Lacole: I am working on my second book, Beautiful Disturbance. It is also going to have a paranormal feel to it, except it will be NA instead of YA. Lacole: Befriend other writers! Follow their pages, encourage them, read their work, review their work, give advice and take their advice. I would have never finished Greekorian if I hadn't connected with other writers. Seeing their books being published gave me confidence to publish my own. It's also been pretty handy to get pointers from them. Before I started doing this, no one was interested in my writing. It was a hard pill to swallow because my passion and addiction is writing and not being able to talk to anyone about it has driven me crazy for so long. I also advise anyone who has a passion for writing to keep doing it. Don't do it because you want to, do it because you have to. Do it because you can't imagine doing anything else. Tricia: Thank you, Lacole, for visiting with us today.